The Escape Game is Now Open in The Battery! Have you ever wanted to plan an art heist? Now you can! America's #1 escape room and immersive adventure is now open in The Battery. 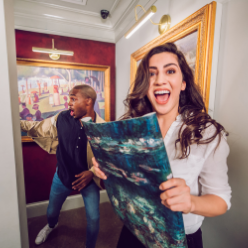 As a premier provider of escape rooms, The Escape Game's adventures play like Hollywood blockbusters with twists, turns, and jaw-dropping surprises around every corner. Have you ever wanted to plan an art heist? Now you can! America's #1 escape room and immersive adventure is now open in The Battery. As a premier provider of escape rooms, The Escape Game's adventures play like Hollywood blockbusters with twists, turns, and jaw-dropping surprises around every corner. Their 60-minute adventures bring epic stories to life in a one-of-a-kind tactile experience. Here's how it works: You and your team will work together to find clues, overcome challenges, and ultimately complete a mission. Escaping will require teamwork, communication, wits, a sense of adventure, and most importantly: YOU! Are you ready to escape?